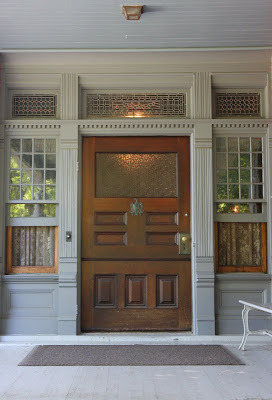 The front door of Teddy Roosevelt's 'Sagamore Hill', designed by Lamb & Rich c. 1884 in Cove Neck. Click HERE for more on 'Sagamore Hill'. Yesterday's post on the beautiful Goodwin Place has me frustrated. I can't read the names on the rooms in the floor plan even with various levels of magnification. It looks like the far right hand room on the Ground Floor may say "Dining Room". Can you see on your copy the names of the other primary ground floor room? And what is the large room on the main floor that is shaded? My copy is the copy that I post. The image is from google books, scanned by someone on their end. I have the same problem as everyone else when it comes to resolution unfortunately.